RPF Recruitment 2017 - Railway (Fake) RPF Vacancy 2017: Apply for 19952 RPF Constable posts in Indian Railway. 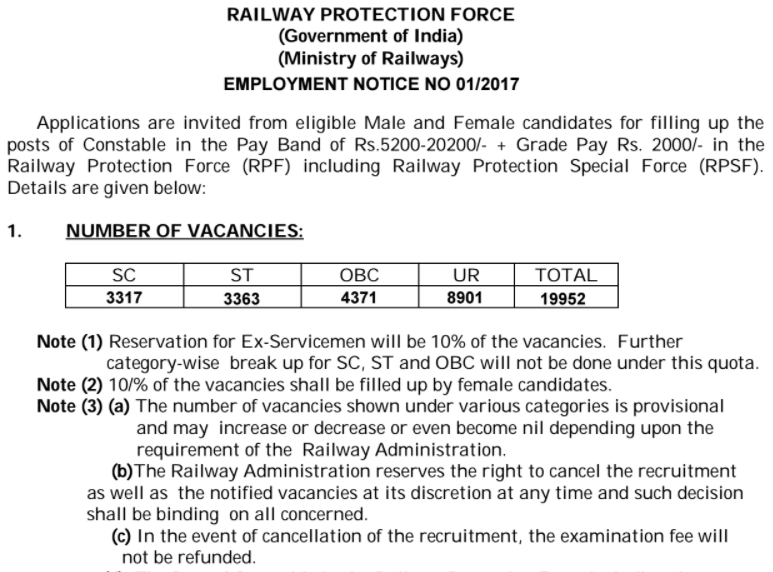 Looking for Railway Protection Force (RPF) Vacancy 2017? RPF notification announced for Constable vacancies. Indian Railway has finally issued a recruitment notification for the recruitment of Railway Protection Force (Constables) post. Applications are invited from male & female candidates for filling up 20000 RPF vacancies in Indian Railway. Update: RPF Fake vacancy for 19952 posts is circulating on Social Media. Age Limit: Candidates age should be between 18 years to 25 years for Male candidates while 18 years to 27 years for Female candidates. In other words candidates must not born before 01.07.1992 and after 01.07.1999. Age limitation will be calculated as on 01-07-2017. Age relaxation is applicable as per the rules. Educational Qualifications: Candidates must have passed Matriculation/ Class 10 or equivalent examination from any recognized Board/ University or Institutions. Online form: Application forms will not be in online mode. Candidates are required to apply through offline mode for RPF posts. Application Fee: Candidates are required to pay Rs. 40/- as application fee in the form of crossed Indian Postal Order or a crossed Bank draft. Female, SC/ ST, Ex-servicemen candidates are exempted from paying application fee. Physical Eligibility: Candidates height must be 165 cm for Male and 157 cm for Female. Physical Endurance Test: Candidates will have to run 1600 Meter for male and 800 Meter for Female candidates only. Long jump and High Jump will also be there. Selection Process: Candidates will be selected on the basis of their performance in Written Examination, Physical Endurance and Measurement Test (PE & MT) followed by Medical test. How to Apply: All those candidates who wish to apply for Railway RPF Vacancy for 19952 Posts, they are required to send their application in the prescribed format on or before 14th October 2017. More Details: Candidates are strongly advised to read official RPF recruitment notification for more details about RPF Vacancy in Railway regarding age limit, educational qualifications, last date, pay scale, how to apply and online application form.